Portlanders love combining their favorite things, like maple and bacon, chicken and waffles, or beakers and flasks. 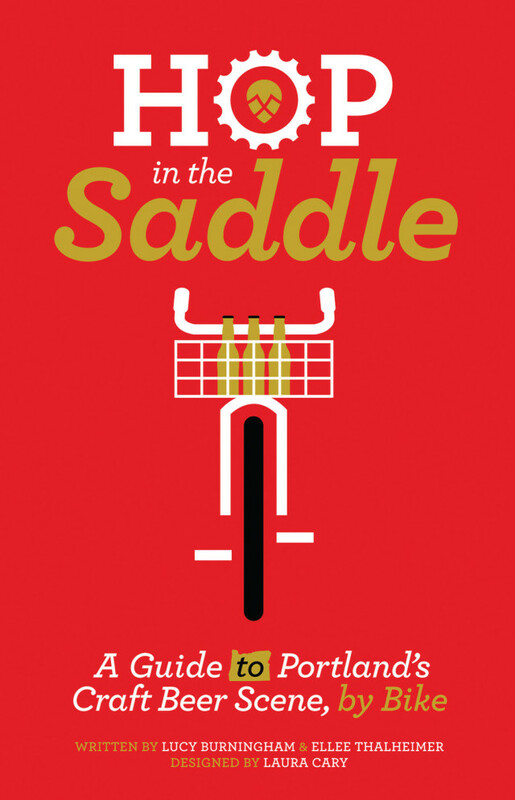 A new book out from a trio of Portlanders aims to combine two more: beer and bikes. Lucy Burningham, Ellee Thalheimer, and Laura Cary's Hop in the Saddle: A Guide to Portland's Craft Beer Scene, by Bike ($9.95; 96 pages) maps out bike-friendly, beer-centric tours of each of the city's five quadrants (with directions for casual peddlers and "bike nerds" alike). The little red book fits comfortable in messenger bags and bike baskets, and covers 20 breweries, 8 bottle shops, and 30 bars and restaurants with a dedication to draughts. I sat down with one of the helmet-and-pint-clad authors, Lucy Burningham, to get her take on winter beers, North Portland's best breweries, and beer sommeliers. 1. Which of the trips in the book would you recommend to someone from out of town to get a real taste of PDX? The book features a beer ride in each of the city’s five quadrants, and they all offer a unique look at our town, but my favorite is the North Portland beer route. The six main beer stops range from the tiny subterranean Upright Brewing taproom to Widmer’s Gasthaus. Between those two stops alone, you have a representation of the progression of Portland’s beer scene. Upright is small and relatively newish, while Widmer is one of the city’s first breweries that has grown exponentially over the years and is now owned by the publicly traded Craft Brew Alliance. Also, there’s no other chapter that includes Interurban, the Mississippi Ave pub with reliably awesome food, and a bike-themed B&B (although there is a beer-themed B&B in Southeast). 2. Why did you and your co-authors choose to include historical information for Portland landmarks? I think I can speak for my co-author Ellee when I say that this book was, in many ways, our love letter to Portland. We wanted to help our readers love this town, too, by providing as much depth as a pocket guide can allow, and telling a little bit of history was one way we set out to accomplish that goal. Besides, if you’re riding your bike through someplace like Ladd’s Addition for the first time, you’re going to wonder just how the hell it came to be. Why keep ’em guessing? 3. What's your favorite kind of beer to drink in the winter? Where will you be drinking it? Tis the season for boozy, heady sipping beers, and since I’ve developed an affinity for bourbon this year, I’m looking forward to trying as many bourbon barrel aged beers as is humanly possible. I plan to do some sampling at Saraveza, my go-to beer bar in North Portland. If they don’t have something intriguing on tap (a rare day), you can always find a good bottle in the coolers. When I want to have my bourbon and beer in separate glasses, I go to The Old Gold. They have an outstanding selection of whiskeys and a delicious combo called “The Ryer,” a half pint of Boneyard Backbone Chocolate Espresso Stout and a shot of Bulleit Rye. 4. Your book highlights info from "knowledgeable beer sommeliers" around town. Which local experts do you find returning to again and again to get the scoop on new developments in the beer scene? Lately I’ve been doing some frequent check ins with Ben Edmunds of Breakside Brewery. I’ve been impressed by many of his beers from the past year, so I’m curious to hear what ingredients/flavor profiles he’s excited about. When I want some straight talk and juicy quotes, I call Van Havig of Gigantic Brewing. 5. Can you tell me a bit more about the chefs that "secretly" cellar beer? I’m guessing there’s a fair number of PDX chefs who have stashes of beers that age well, and I’m intent on sniffing them all out. Confessed beer cellar keepers: Paul Kasten of Wildwood, Ben Meyers of Grain & Gristle, and Greg Higgins of Higgins Restaurant. Also, I have my suspicions about restaurateurs Steve Jones of Cheese Bar and Stumptown founder Duane Sorenson.